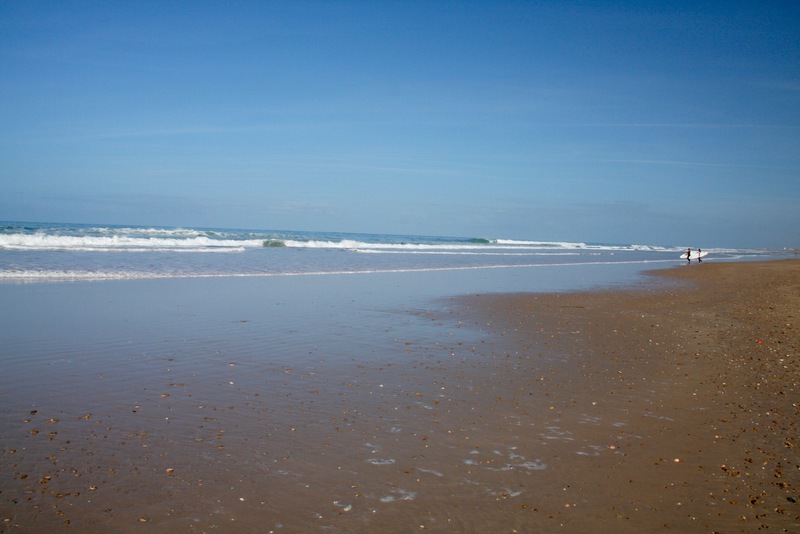 If you live in northern Europe, there is something very exciting about being on a beach in winter when it’s warm enough to pretend it’s summer. 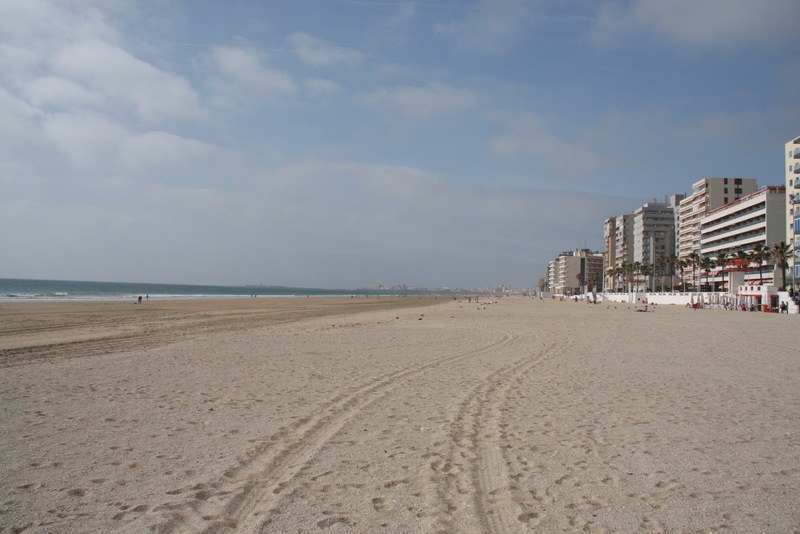 The weather in Cadiz made that possible. 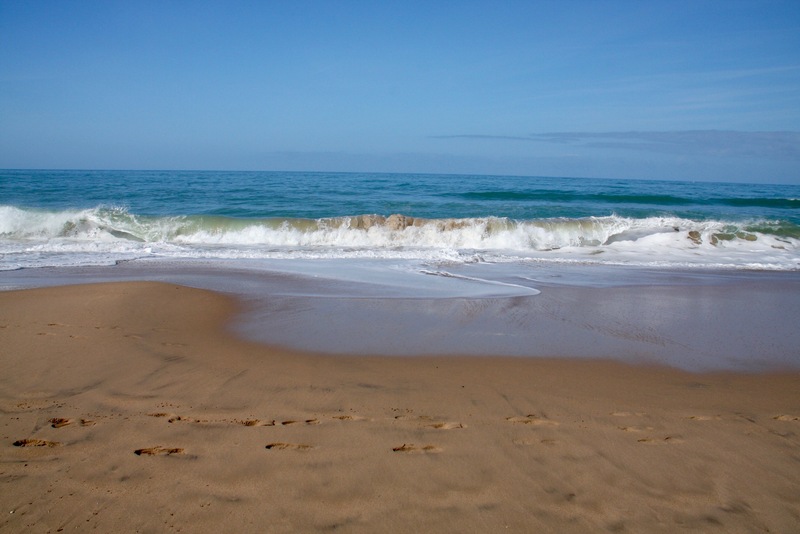 The beaches of Spain’s Atlantic coast are a bit wilder, and the water quite a bit colder, than their more famous Mediterranean counterparts, but they have a raw beauty that more than compensates. 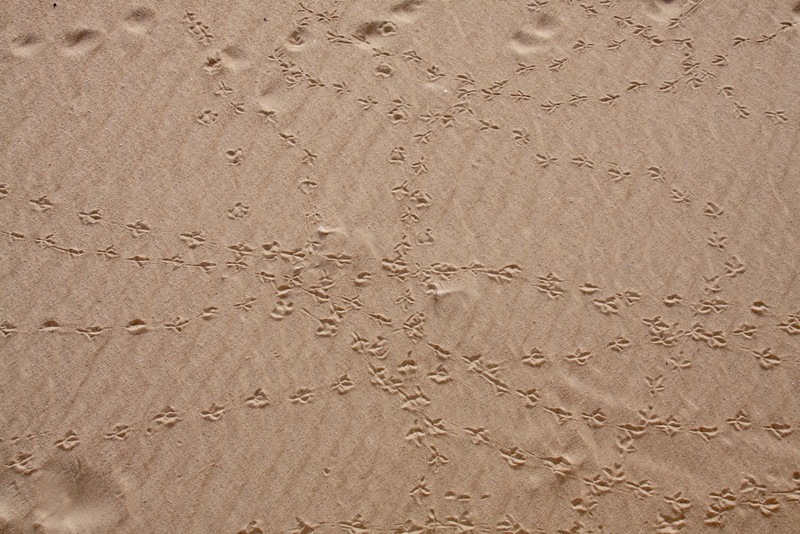 Plus, they only attract a fraction of the visitors. 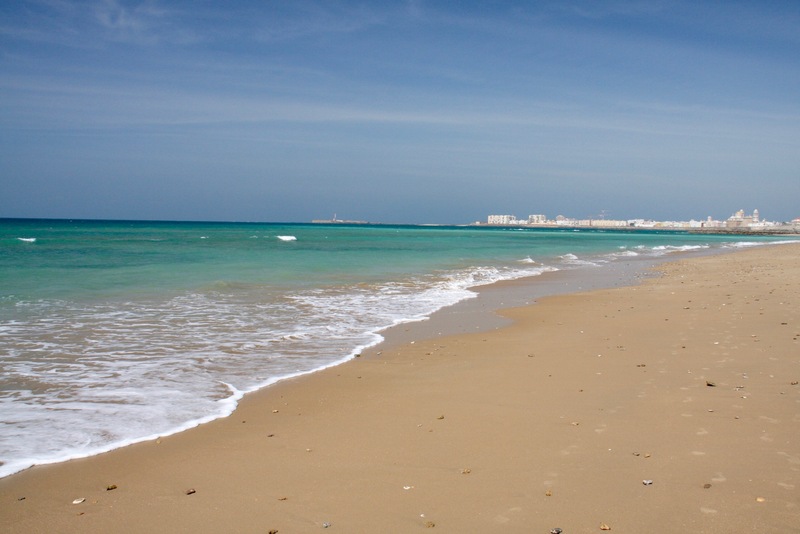 If you’re visiting Cadiz it’s worth spending a day walking the beaches that spread south from the city. 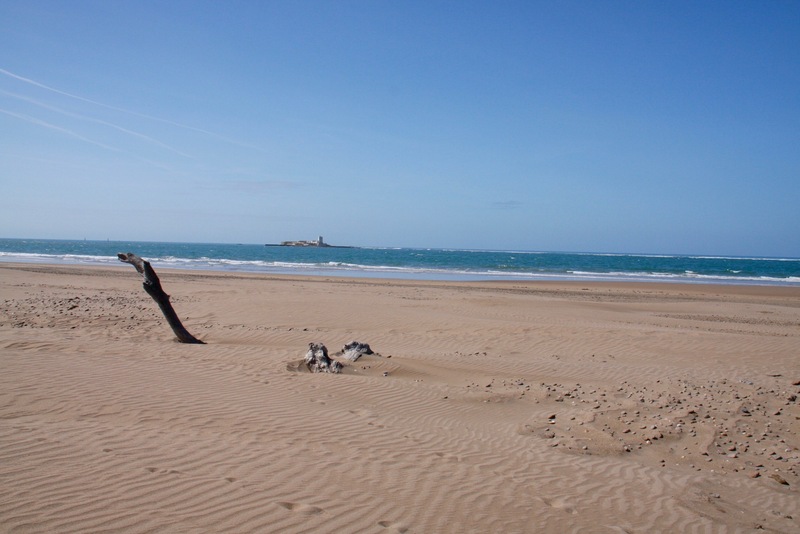 We got up early and drove to the Parque Natural Bahía de Cádiz, a large area of sandy beaches, freshwater lakes, marshes and salt flats, the salt from which has been used since 1100 BC. 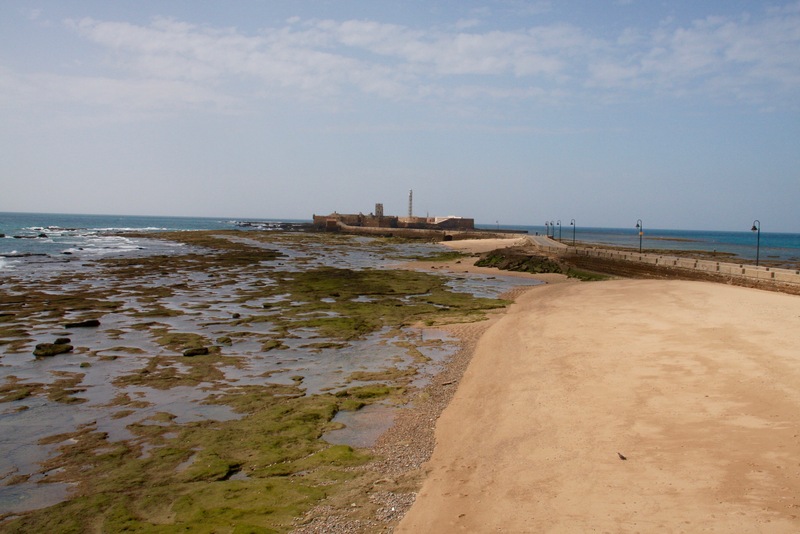 Phoenician traders who first settled this area exported it. 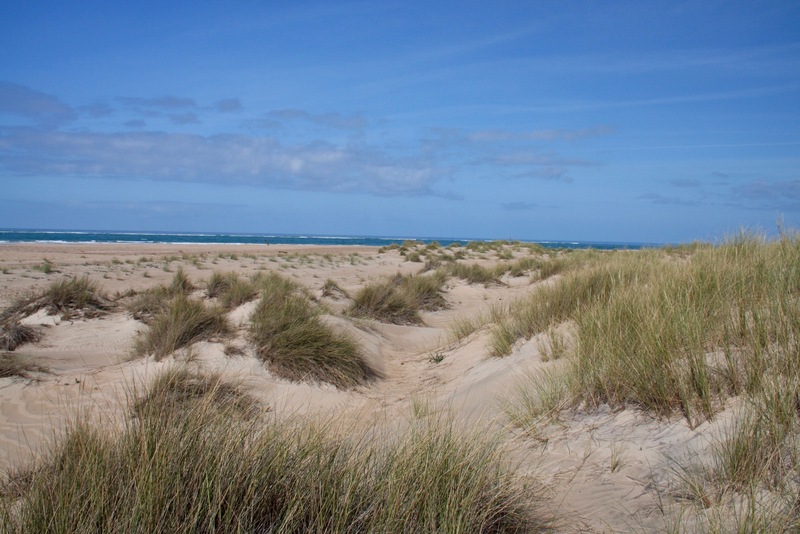 The long wide beach makes for a wonderful early morning stroll. 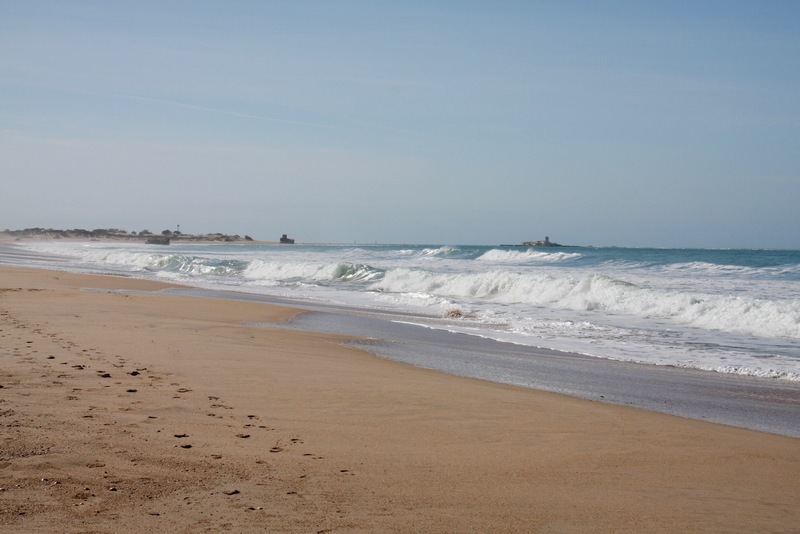 We headed along the beach to the Punta del Boquerón, the warm sun was offset by a cooling breeze. 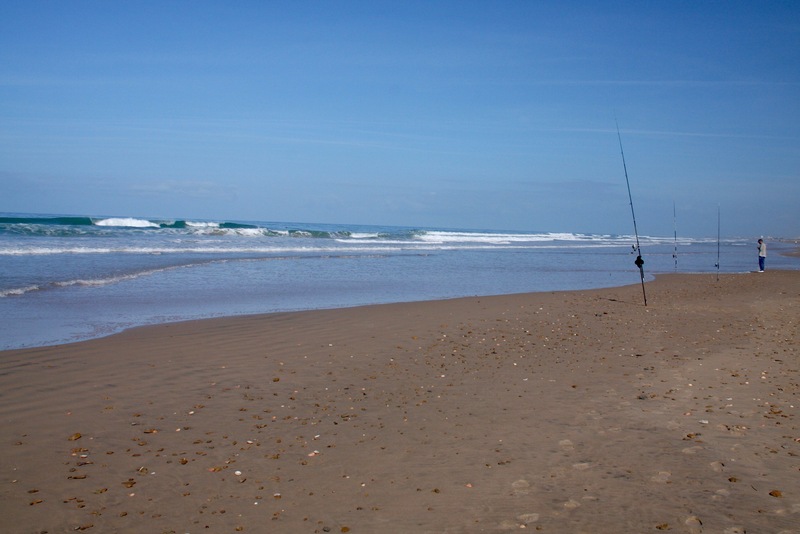 Fishermen were lined up along the beach and a few hardy surfers were making their way into the water. In the distance I could see what looked like giant boulders on the beach, and off the coast was the island of Sancti Petri, home to the Castle of Sancti Petri. As we approached, the boulders took on a more regular form and it became clear that they were modern additions to the beach. 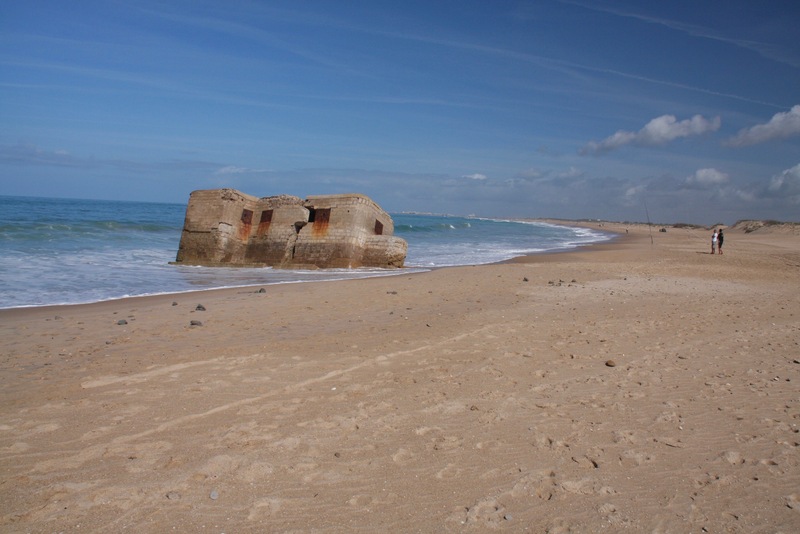 These were bunkers used during the Spanish Civil War and World War II to protect this coast and Cadiz from attack. Today, they’re crumbling monuments to a dark and dreadful part of Spain’s and Europe’s history. 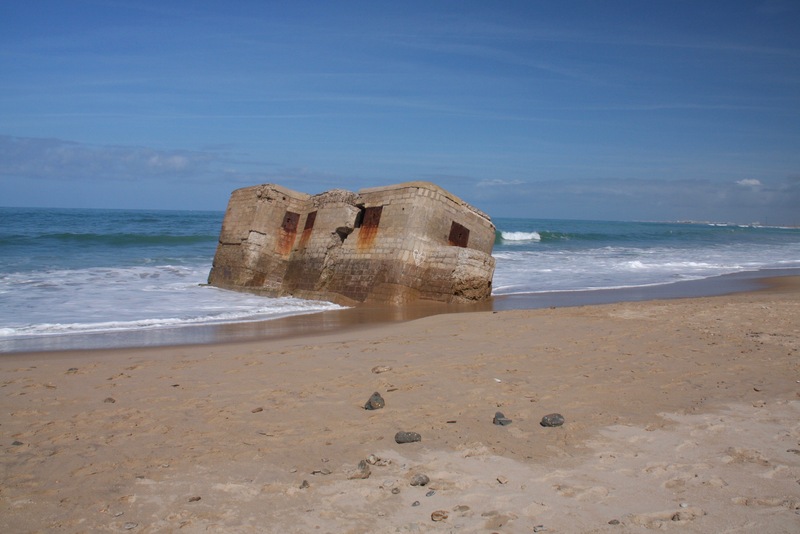 They are in pretty bad condition, battered by water, wind and sand. How long they will survive is anyone’s guess. 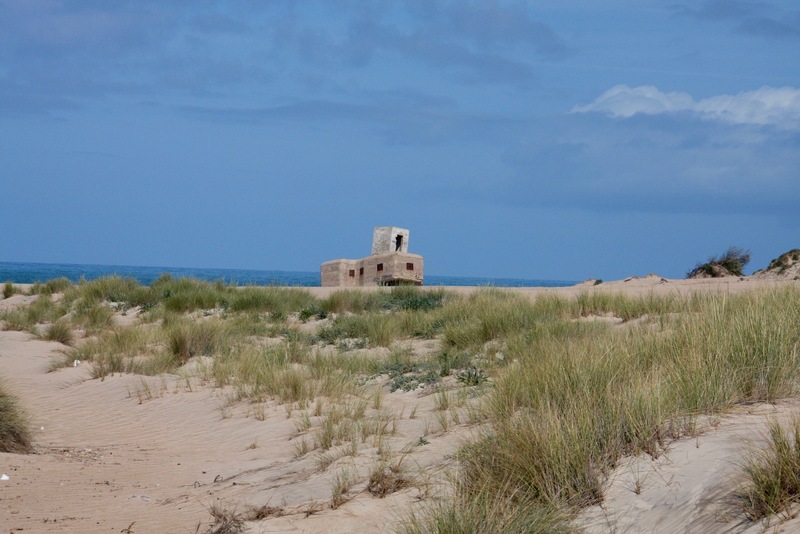 Sancti Petri dates from a much earlier period, and was part of a system of 16th and 17th century coastal watchtowers constructed by order of Felipe II. 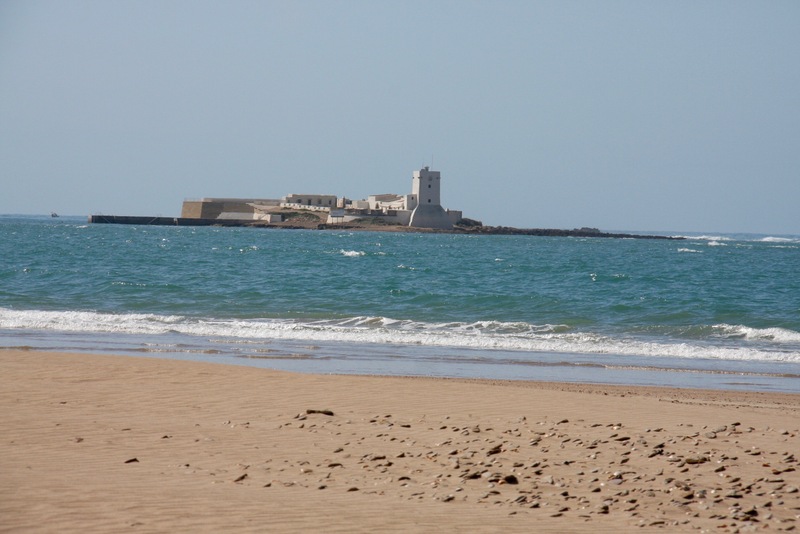 The fortress was built as part of the defences of Cadiz, the intention being to protect Spanish shipping arriving back from the Americas, often laden with treasure, from Barbary Pirates and English privateers. The earliest part of the fort is from that time, but it was expanded in the 18th century. 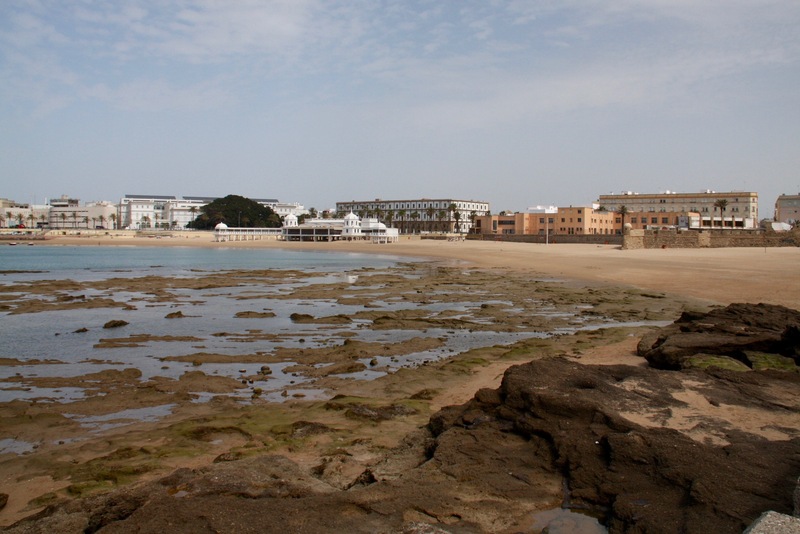 Driving back into Cadiz we noticed a lot of restaurants with ocean views. It was Sunday and we decided we’d earned a long lunch. We ditched the car at the hotel and walked back along the seafront. We reached a strip of restaurants near the monumentally ugly Hotel Playa Victoria close to the football ground. The architecture in this area isn’t very attractive, but the seafood was excellent and came with ocean views. 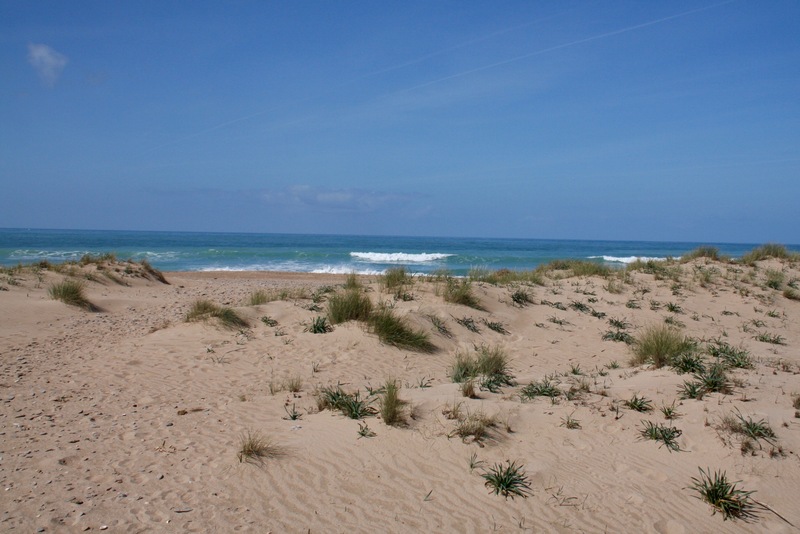 Afterwards, we retired to the beach to sleep off our delicious lunch. 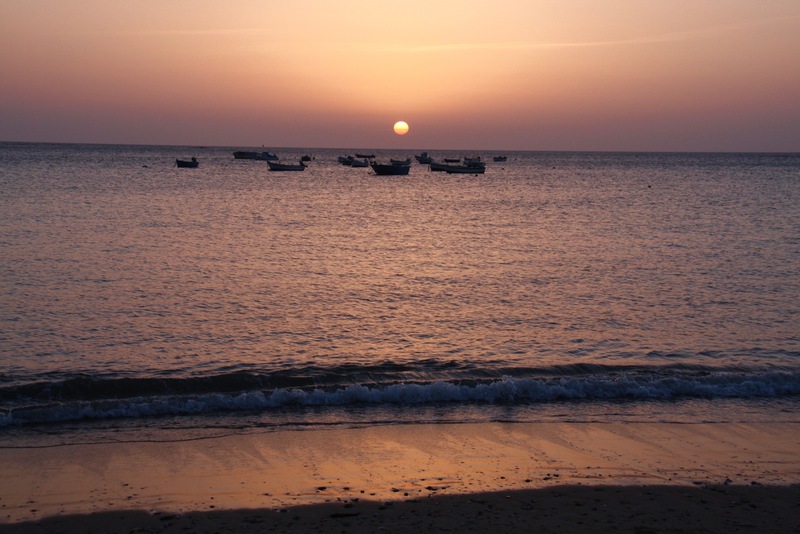 It seemed like the perfect way to end our stay in Cadiz. My grandfather had a saying, used to explain the inexplicable. A dour, world-weary phrase that summed up the whole of human existence. It came without the need for further explanation, a full stop to any conversation. “Aye, there’s now’t as strange as folk”, was pronounced whilst listening to news of extraordinary events somewhere in the world, or local gossip, before going back to reading the Westmorland Gazette. That phrase came forcefully to mind recently. 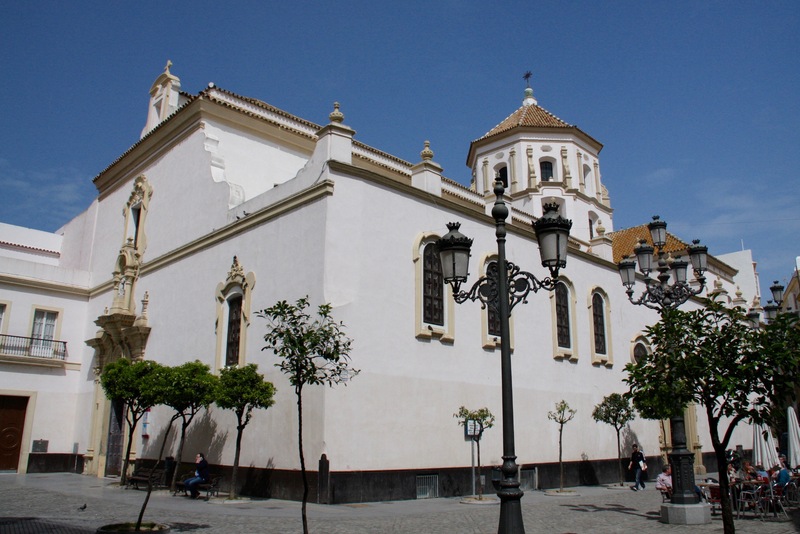 I was extolling the joys of Cadiz to an old friend, telling her about how exhilarating the city was, how glorious the nearby beaches, how delicious the seafood washed down with a chilled glass of fino … I was met with a stoney silence, broken only when she said, “Oh, we went there a couple of years ago. We hated it.” Hated it! 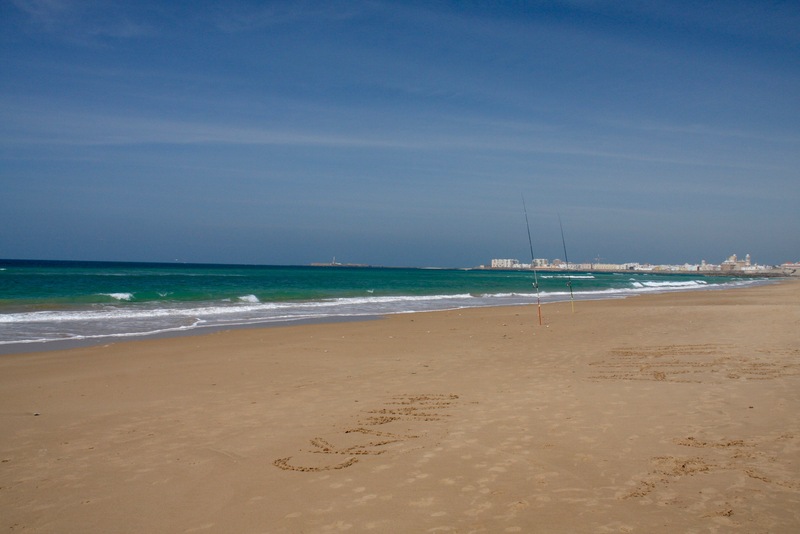 How can anyone hate Cadiz? People really are strange. 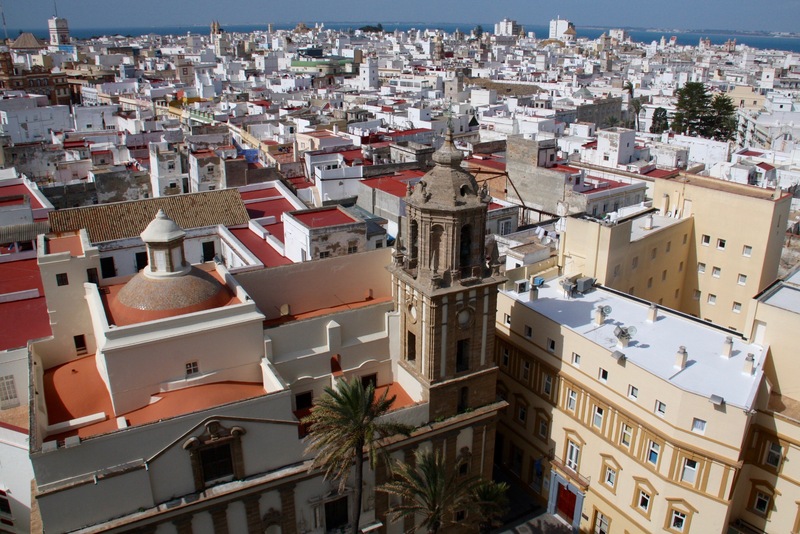 Cadiz may be more down to earth than its famous Andalusian rivals; its buildings may be more weathered, with peeling paint and crumbling plaster; and it may be a little rough around the edges, but that just adds to the phenomenal charm of this glorious city. After all, this is the oldest continuously inhabited city in Europe. It must be doing something right. 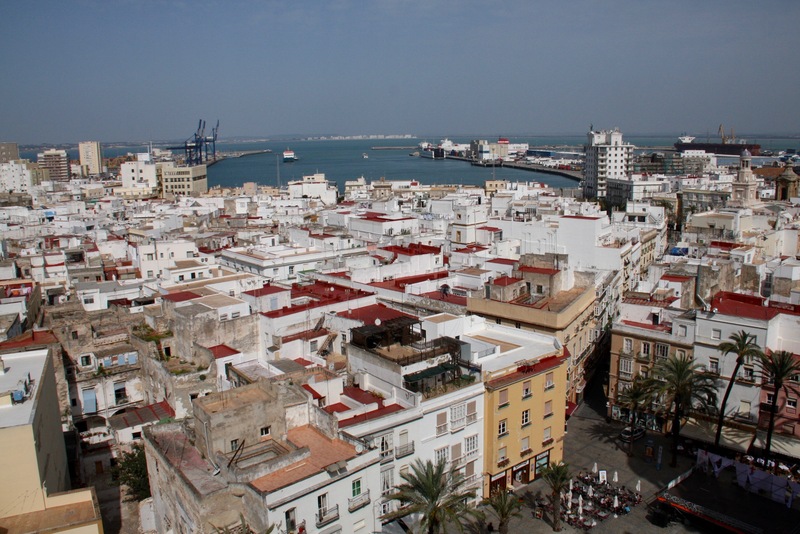 Cadiz sits on a narrow strip of land jutting out from Spain into the Atlantic Ocean. 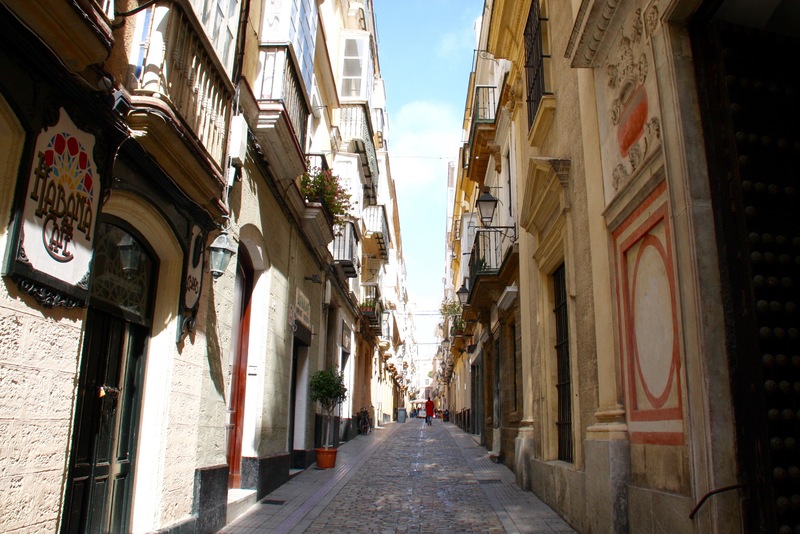 The ancient old town is shaped like a ball at the end of the peninsular, and crammed within its narrow confines are historic neighbourhoods, dozens of ancient churches, leafy plazas and atmospheric bars. 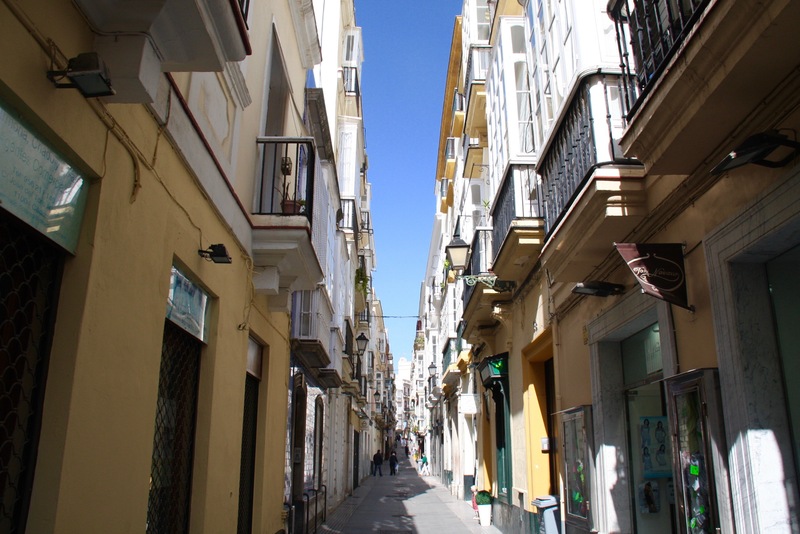 The tightly packed streets are a little claustrophobic, emerging out of them into the brilliant sunlight of the ocean front is almost shocking. 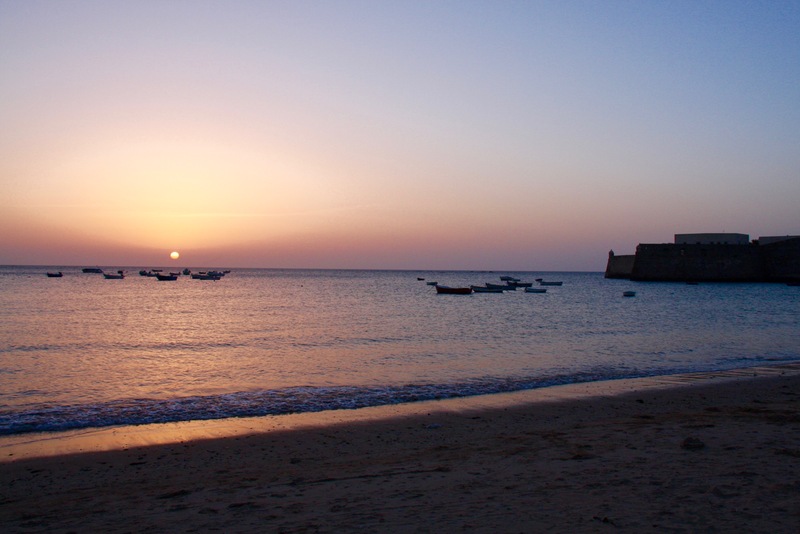 La Caleta, the city beach, is wedged between old forts and offers sweeping panoramas over the ocean. 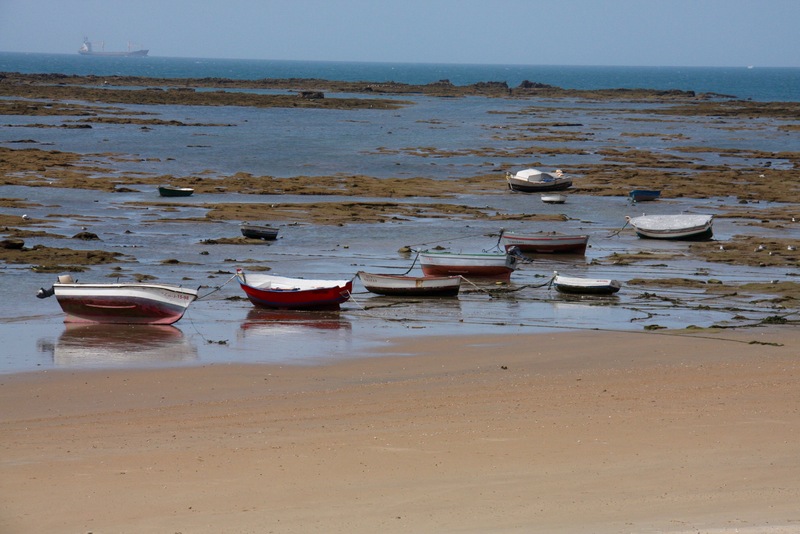 Small fishing boats picturesquely bob up and down on the waves. 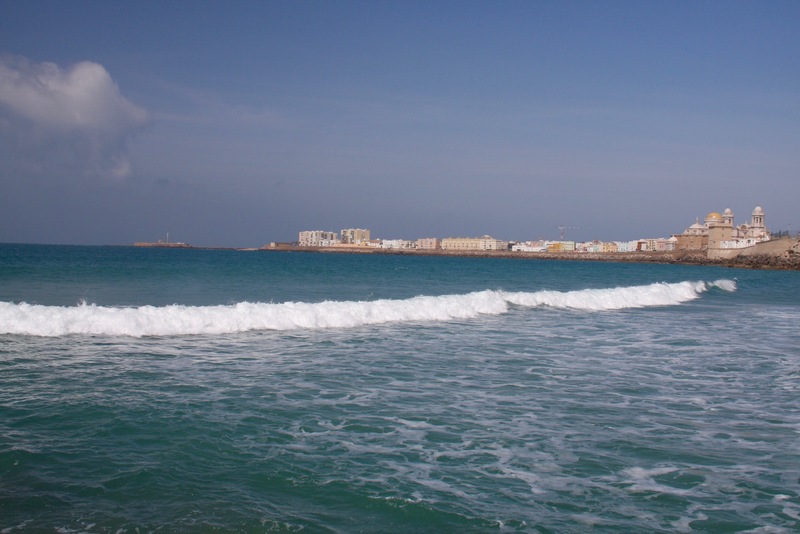 This area has gained the nickname of Little Havana, the city’s seafront doing a passable impersonation of Havana’s Malecón – Havana’s crenelated fortifications are modelled on Cadiz. Like its more famous counterpart, it’s definitely the place to be at sunset. 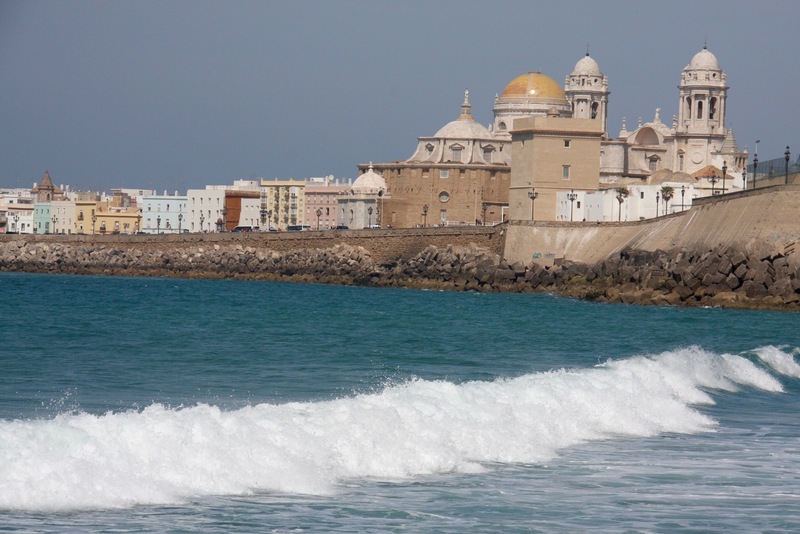 Cadiz’s relationship with the sea dates back millennia, it’s a suitably excitement-packed history. The city was founded in 1100 BC by Phoenician traders. 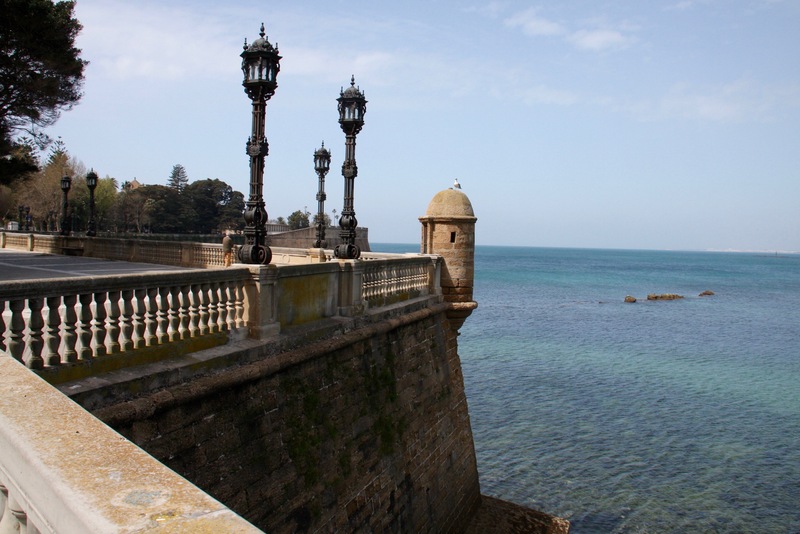 Centuries later it was captured by the Carthaginians, and Spain became the main European stronghold for Carthage’s resistance to the Roman Empire. It was from Spain that Hannibal launched an offensive against Rome involving his legendary crossing of the Alps on elephants. After the final defeat of Carthage the city became Roman, whose empire in turn collapsed. 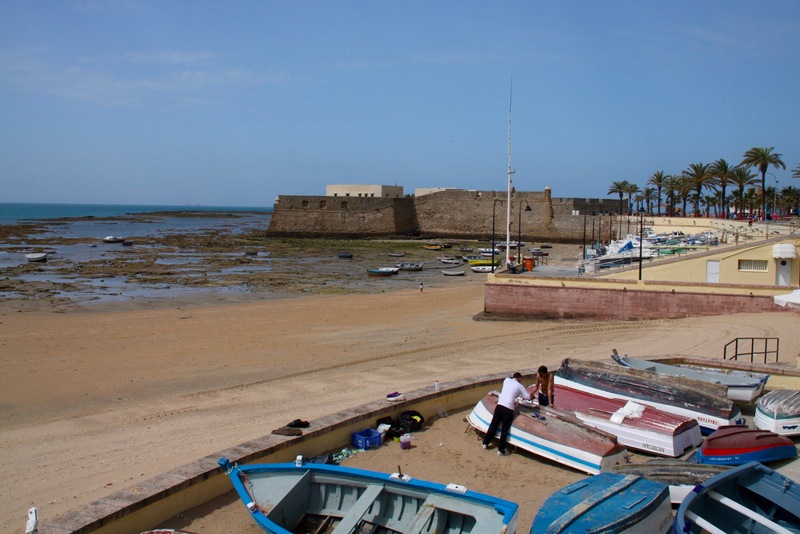 Cadiz was controlled by different civilisations until the arrival of the Moors in 711, after which it was renamed Jazirat Qadis. For the next 551 years it remained a vital port and stronghold for Moorish rule. It fell to Alfonso X of Castile during the Reconquista in 1262, and has been Spanish ever since. 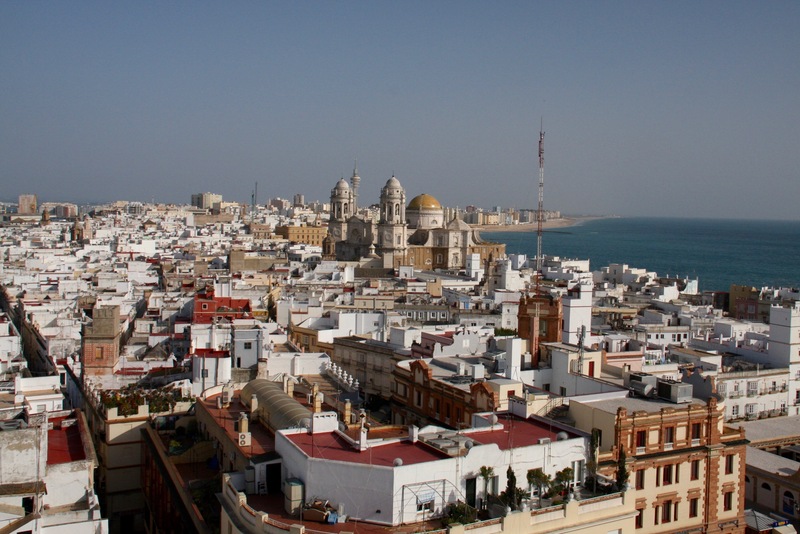 The city boomed after the discovery of the Americas in 1492, becoming the base for Spain’s treasure fleets. 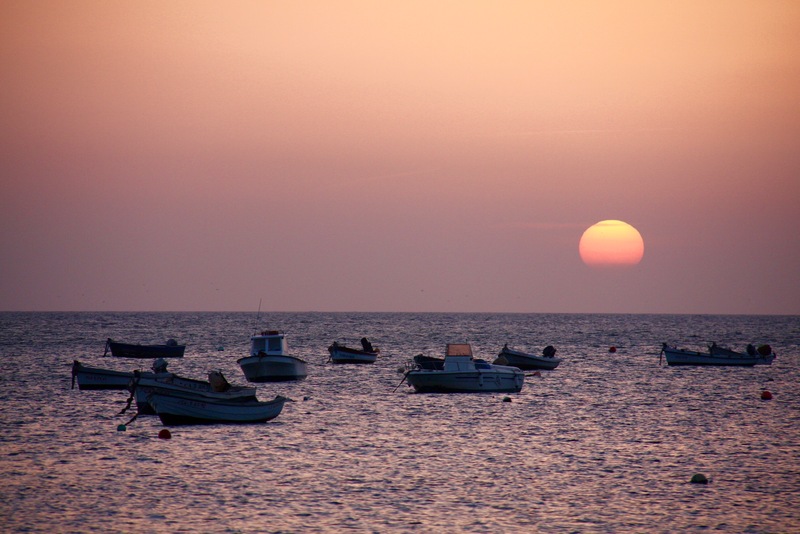 Gold and silver, flowing across the Atlantic, made Cadiz rich. It also made it a target for anyone who wanted to get their hands on Spanish gold. Chief amongst whom were the ‘privateers’ working for Elizabeth I of England. Sir Francis Drake attacked the port in 1587. Lord Essex launched a more destructive attack in 1596, burning the city, including the 13th century cathedral. 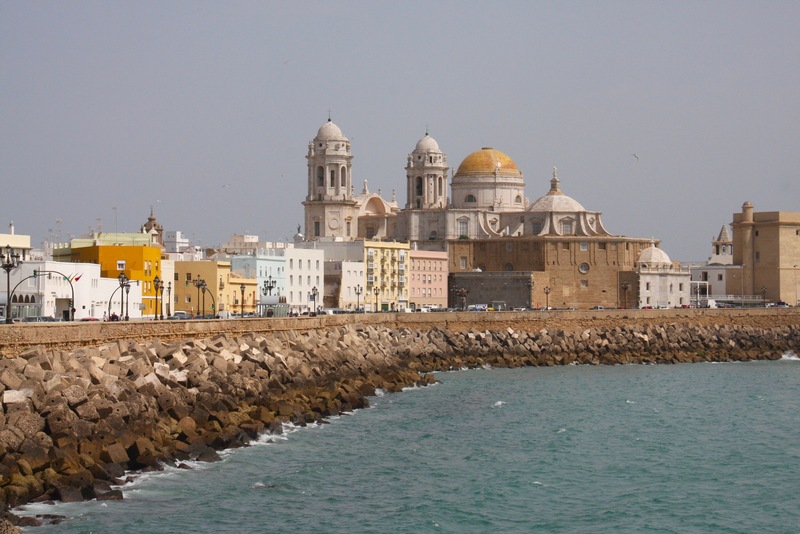 Cadiz briefly became the capital of Spain during the Napoleonic Wars, when Spain was occupied by the French. The city bore witness to Admiral Horatio Nelson’s victory at Trafalgar in 1805, which included the destruction of a Spanish fleet. This loss, and Napoleon’s occupation, hastened the collapse of Spain’s empire, without which Cadiz slid into a long period of decline from which it has never fully recovered. Today this extraordinarily rich history is writ large across the city. The best way of discovering it is to wander aimlessly and let it find you. 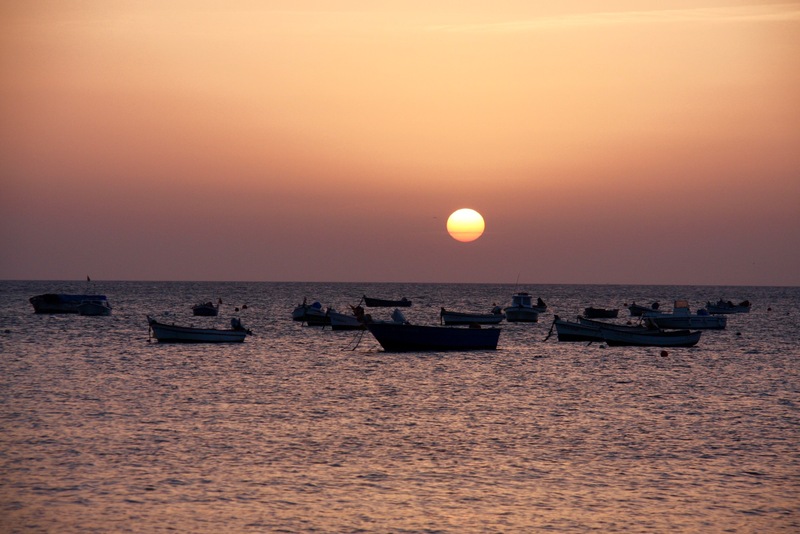 In between, stop off at the many tapas places on pretty plazas, have a sherry (or two) in atmospheric bars, and eat fried fish on La Caleta watching the sun set while imagining the sights this city has seen over the centuries. What’s not to love about that?